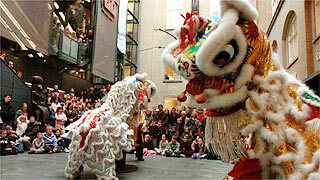 Over Chinese New Year and all year round the club performs lion dance and martial arts displays. Apart from the normal shows for Chinese New Year the club has also performed many charity shows, performed for schools, performed abroad in Sweden, Czech Republic & Ireland and for local TV. We have also performed a charity show in aid of the British Red Cross and helped to raise £5,000. No Lessons on bank holidays.